← Defending Conventional Beef in The Wall St Journal Today! Media articles relating to agriculture appear to fall into two groups. Those relating to small-scale agriculture are glowing accounts of farmers wearing overalls and straw hats; lovingly taking care of the land and animals according to holistic principles; and selling their produce at the local farmers’ market. By contrast, commentary upon large-scale agriculture invokes images of corporate-controlled factory farms with blatant disregard for animal welfare and local community issues; blithely pumping animal manure into water courses. To consumers, the majority of whom do not understand agriculture, but have questions about how their food is produced, the choice (as presented by the media) is clear. Small farms must be better for the environment, the economy and the local community. According to the Food and Agriculture Organisation of the United Nations (FAO), we need to sustainably intensify food production over the coming years in order to feed the increasing global population. For many however, the concept of intensification and high-efficiency production systems appears to be contrary to the holistic, small-farm philosophy. I will be presenting at the “World Congress on Controversies and Consensus in Bovine Health, Industry & Economics” in Berlin later this week, and have been asked to debate the question “Are hyper-intensive, mega farms more efficient?” If we examine the science, the results are unequivocal. 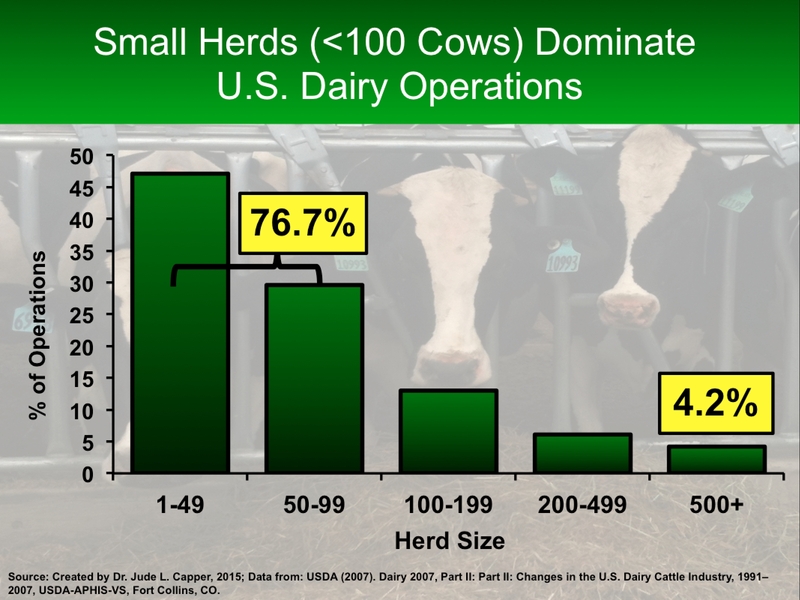 To use the U.S. dairy industry as an example: over three-quarters (76.7%) of dairy farms have small herds (less than 100 cows) and only 4.2% are large, with more than 500 cows in the herd. 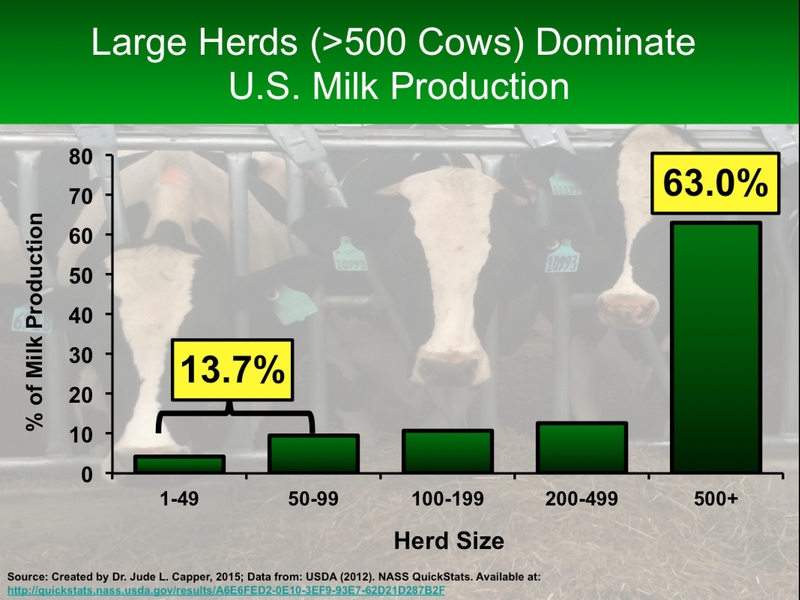 Yet the contribution to total milk supply is disproportionate – those 76.7% of herds containing <100 cows produce only 13.7% of U.S. milk, whereas the 4.2% of farms with >500 cows produce 63.0% of U.S. milk. 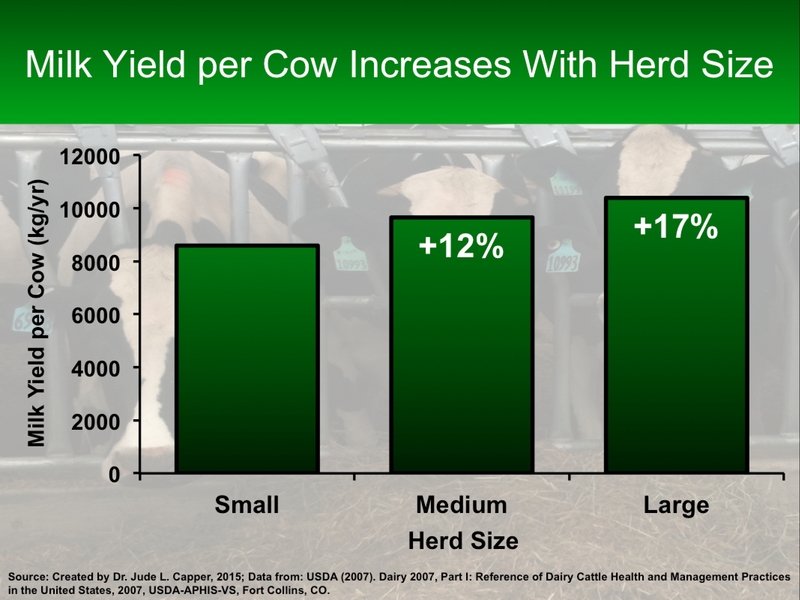 A 17% increase in milk yield per cow is exhibited in large herds compared to small herds – does this mean that so-called mega farms are more efficient? Yes. They have a higher output of milk per unit of input. Data from the FAO also shows that as milk yield increases, the carbon footprint (and other resource use impacts) per unit of dairy is reduced. Does this mean that large herds are better? Not necessarily. There’s no measure of animal health, worker conditions, or community support in these data. Yet these issues are size-independent. It’s possible to have poor animal health or worker conditions on a small farm, just as it is on a large farm. I’ve seen some great small operations, but also visited amazing large farms, including a 1,200 cow dairy in SE England where I was extremely impressed to see that they had a hospital pen to segregate sick cows from the rest of the herd, and that it only contained 12 cows. A 1% morbidity rate. How would that compare to the average human workplace, school or city? Is there an ideal farm or herd size? 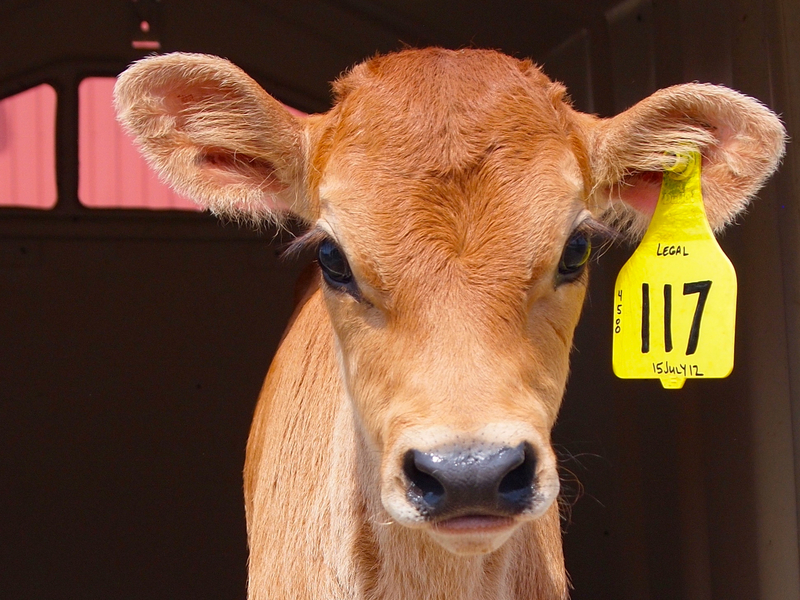 A blueprint to lead the global dairy industry during the current crisis? No. Dairy farms vary considerably – it would be foolish to suggest that there is only one sustainable way to produce milk (although this approach is often taken by certain NGO groups). However, one thing is clear. As we approach a global population of 9.5+ billion people in 2015, we need to stop vilifying large farms and worshipping small farms, and instead promote efficient, well-managed, productive farms that can survive the crisis, regardless of size. 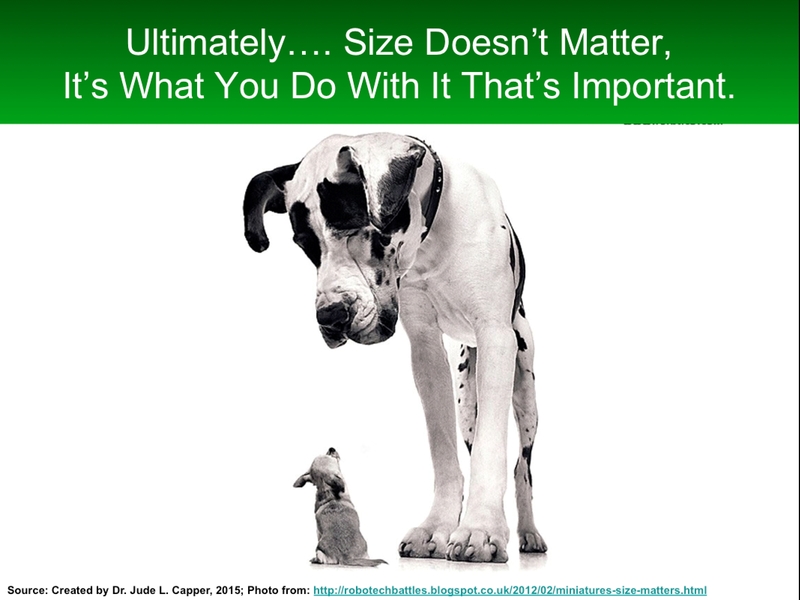 As the saying goes – it’s not size that matters, it’s what you do with it that counts. This entry was posted in Animal Health, Animal Welfare, Cattle, Dairy, Dairy Cows, Economics, Efficiency, Factory Farm, Greenhouse Gas Emissions, Intensification, Mega-Farm, Milk Yield, Small Farm, Sustainability and tagged Animal Health, Animal welfare, CoBo, Dairy, Dairy Cows, Efficiency, Environmental Impact, Factory Farm, Farmers' Market, Greenhouse Gases, Mega-Farm, Milk Yield, Productivity, Small Farm, Sustainability, US Dairy. Bookmark the permalink. The data are also quite clear on cow health and milk quality. Several large-scale studies in the USA involving thousands of farms and hundreds of thousands of cows show that smaller farms have poorer cow health (higher somatic cell counts) and higher bacterial levels (higher standard plate counts) than larger farms. For anyone that wants to seek, the data are there for you to see.